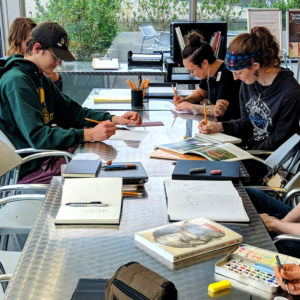 Professional, casual, and amateur artists and illustrators come bring your own art supplies and draw, create, and socialize with artists and illustrators at TAM’s FREE Thursday Night Drawing Jam! Drawing Jam is open to anyone wanting to practice art among peers and is the perfect place to build your skills, meet other artists, and find inspiration. Drawing Jam is organized by a passionate team of Tacoma Art Museum employees with professional and semi-professional backgrounds in art. We are excited to open the museum to local artists and illustrators as a casual place to meet up! Thursday Night Drawing Jam is held in a comfortable, dedicated space on the third floor during TAM’s Free Neighborhood Night (5-8 pm). See our events calendar for more Neighborhood Nights at TAM. And be sure to enjoy stop by TAM Cafe from 4 – 7 pm for happy hour specials! Click to get directions to TAM.